The Select technology is featured in the Talis as well as the Croma shower system (inset). Leading German sanitary fittings manufacturer Hansgrohe has opened two new showrooms in the Middle East. The latest regional openings – in Abu Dhabi (UAE) and Amman (Jordan) – are part of Hansgrohe’s wider expansion of the business, and also due to an increase in local demand for its high-tech products, said a top official. “In Abu Dhabi, the showroom will serve as an orientation centre for architects and interior designers, and will feature a whole floor of vignette-style settings for the company’s chic Axor interior design collection,” explains Dirk Schilmoeller, the sales director of Hansgrohe Middle East. The Jordan showroom is part of a recent partnership with Al Nabulsi and Al Amad, a renowned home décor company. The space will present the new Hansgrohe and Axor ShowTec range in an extraordinary and highly attractive, modular display concept. Highlighting the reasons for the company’s success in the region, he says: “Since entering the Middle East market in the late 1990s, Hansgrohe has been very successful because it carries the respected ‘Made in Germany’ stamp, assuring quality. Also, the brand has been careful to understand the unique needs of this region. 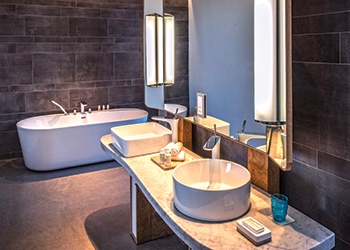 Nikki Beach Resort and Spa ... Hansgrohe supplied a wide range of products. All its products have been well received in the market, particularly its recent innovations including the Metris Select and Talis Select kitchen mixers, Croma and Axor One. 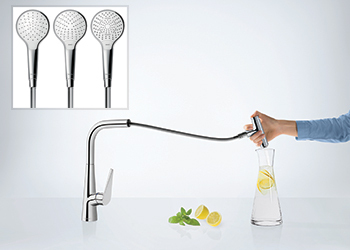 Metris Select and Talis Select kitchen mixers fit in well with a variety of kitchen design styles and harmonise with the shape of many sinks. The sleek transition from body to spout emphasises the modern design language and makes them easy to clean. The Select button is located on the top of the pull-out spray head and is thus ergonomically positioned to accommodate the thumb. The swivel spout has a 150-degree range and can be turned in any direction, making it very convenient for use with double sinks, he adds. The Select technology is also featured in the Croma shower system, making it easy to switch between spray modes at the intuitive touch of a button. The Croma Select multi hand shower provides an individualised shower experience with three different kinds of spray: a soft rain shower, a powerful intense rain mode, and a pulsating water jet massage. Over the years, Hansgrohe has worked on a vast range of high-profile projects in the Middle East. Recently, the company completed work on Nikki Beach Resort and Spa located on Pearl Jumeirah – a stunning new beachfront boutique property in Dubai, UAE. Hansgrohe supplied the entire resort with its top-of-the-range PuraVida Hansgrohe collection, Croma Select and Raindance Select for the showers using the Select technology. Earlier in March, the Hansgrohe Group, in a press statement announced that it had concluded its 2015 financial year once again with record sales and earnings. Thorsten Klapproth, chairman of the executive board at Hansgrohe SE and Udo Kraus, vice-president controlling and finance, announced the results at the company’s annual press conference held in Frankfurt in March. The globally operating company generated a total of €964 million ($1.09 billion) in sales last year compared to €874.1 million ($991 million) in the previous year, which corresponds to an increase of 10.3 per cent. EBITDA (earnings before interest, taxes, depreciation, and amortisation) rose by €6 million ($6.84 million) to €187.5 million ($213.8 million), which means that results also hit an all-time high.